Nestled amongst trees in a quiet cul de sac in Melbourne’s Caulfield North, this 1930s home is a stylish and sophisticated family abode. Who lives here? Interior consultant Rebecca Shnider, husband Braham and three kids, Romy, Blake and Berry. 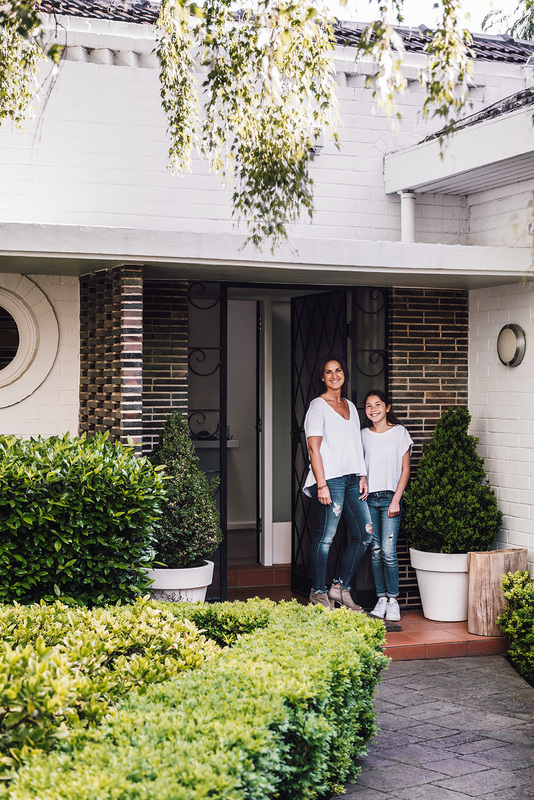 How the serial renovators extended their character home for modern family living. Although the home was in good condition, the family needed more space and, with plenty of renovating experience and a passion for interior design, they embarked on a six week renovation. This involved extending the home and a new kitchen, designed by Rebecca herself. towards the Liquid Amber Tree and Boston Ivy growing over the windows. An Escea DL850 gas fireplace warms the living area. Heating the large, open plan living/dining/kitchen area. A kilim rug sits above the Escea fireplace. Hidden shelves beneath the fireplace store AV equipment seamlessly away. Live in the house first to get a feel for it. Don’t be afraid to add colour and texture. Do your research thoroughly before starting any work as to minimise variations and costly mistakes. The modern kitchen still has a classic feel. Bec designed the kitchen herself, and especially loves the handmade white tile splashback. The family added skylights to the south facing kitchen for an infusion of natural light. Glass cabinetry, Kartell Ghost chairs and glass pendants add airy sophistication. Bec's home is full of colourful art and personal touches. "I believe you should display pieces that you love and evoke a pleasant memory." Rebecca’s flair for interior design is evident all throughout her home. It’s a passion that has now extended further than her own home, with Rebecca starting her own interior consultant business that has developed organically through word of mouth. The art lover says she is always on the lookout for emerging Australian artists to add to her collection. She’s also contemplating a new couch for her study and in the process of designing a plunge pool for our back yard.